Pilgrim opens with his Bluff attempt to convince the demons he's Ulric. Surprisingly, he succeeds. For an added layer of humor, I have the Imps discuss the matter among themselves and decide that nobody would be crazy/stupid enough to disguise themselves as the guy whose house they're breaking into. The Imps express surprise that Ulric, of all people, would be working with a bunch of non-humans. Pilgrim-Ulric explains that these freaks are working for him, and there's no need to be concerned. Next, the Imps ask why Ulric was taking away their agreed-upon payment. Pilgrim-Ulric asks for clarification on what the payment was for. Another Bluff check, he passes, and the Imps explain. Ulric needed an extra boost of magical energy to pull off a big spell, so the Imps have arranged for a small cosmic re-alignment on the next full moon to give him access to additional power. Ulric tries to find out what that spell is, but the Imps aren't aware. Imps are lesser devils, acting as emissaries for more powerful devils and demons. They make deals with mortals in an attempt to corrupt them, with the general goal of causing chaos and pain. The Evistro is just the muscle, the enforcer who protects them while they make deals and exacts punishment if the deals are broken. With this knowledge in mind, Pilgrim asks if it might be possible to cancel his (Ulric's) earlier request and put his (Ulric's) plans on hold for the time being. The Imps inform him that considerable work has been done already, and they're not backing out without getting something out of the deal. Pilgrim offers to provide them with payment for the work they've done, but they won't settle for anything less than the full agreed amount. He concedes, and they depart through the hole they came through, taking the chest with them. The tunnel collapses after they leave, and the party receives some XP for passing the skill challenges. With that behind them, the party inspects the room. The runes on the pedestal are old, in a language none of the party recognizes (Primordial). The altar is covered with books, papers and notes. Closer inspection with an active Perception check tells the group that some of the books deal in Necromancy magic, and others are notes on the god Zarus, the patron deity of Humanity. Sharp eyed readers might remember previous reference to Zarus from the initial murder, but how that relates to this is still unknown. Among the notes, they also find a memo from the Splinter Brothers Slaughterhouse, which supplies all the major taverns and most of the city's population with meat and leather, detailing shipments of meat and an ominous list of names, many of which have been crossed out. Ulric's name is on the list. Sudden noise from upstairs alerts the party to some violence. 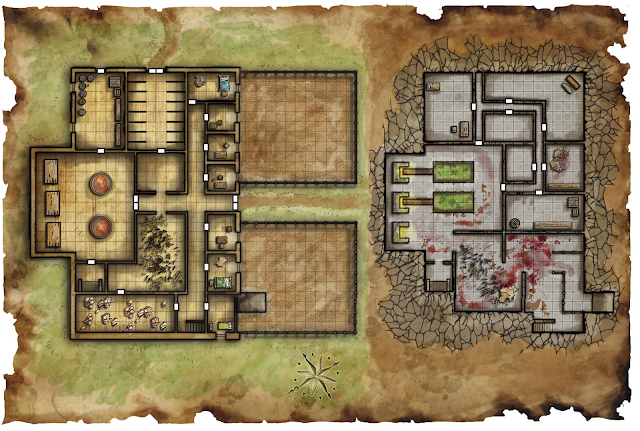 They hear a screaming Imp, then a deep roar and a loud smash, as a section of the wood ceiling crashes down into the room, along with the corpse of an Imp, killed with a heavy blunt weapon. Through the ceiling hole the second Imp, apparently free of its restraints, jumps down into the basement and regards the party with surprise and fear. Before anyone can react, Bo Do the Dwarven Blacksmith drops through the ceiling and brings his Warhammer down on the Imp with enough force to paint the adjacent walls with skull jelly. Bo Do, still in mid-rampage, eyes the party and settles on Pilgrim, who is still in Ulric disguise. Do hefts the Warhammer and advances on Pilgrim with murder in his eyes, but Pilgrim quickly removes his mask and reveals himself to calm the furious Dwarf. Apparently Do came with the intent to avenge the death of his friend, Jamie the owner of the Green Dragon Inn. Before they can discuss the situation further, a dozen guards storm the house, alerted by the big Dwarf-sized hole in the front door. The party still has their letter from Captain Warrik to back them up, but Bo Do is still arrested for breaking and entering, and the guards round everyone up to bring them back for questioning. Back to the Garrison, where Warrik and his second in command Radak want a progress update on the investigation. The party reveals what they know, which isn't much. Warrik isn't all that thrilled with the party, who haven't managed to do much more than rack up a body count and steal from shopkeepers. At mention of this, Cleo's player is visibly annoyed that I'm making such a big deal out of her character's theft. I explain to her that I'm actually really happy that she's making the effort to accurately roleplay her character and act in a believable manner for that character. As the DM, I'm not making any judgements on the actions of the party, my only job is to ensure that actions have appropriate consequences, good or bad. Warrik considers firing the party, but Radak insists that things are getting worse in the city and there's no harm in letting the party continue their work for the time being. The Slaughterhouse memo provides the most promising lead, so the party goes there next. It's daytime, so the place is open and active. Out front there are cattle pens packed with grazing cows, some of whom are lead down a ramp into the basement of the facility. The party discusses their plan of attack. Cleo is actually a specialist in this field and has a brilliant plan. First, she casts her Animal Messenger ritual on a small spider, which enables her to pass a message onto that spider and compel that spider to seek out another person to deliver it. Then she uses her Skittering Sneak power to transform into a spider, scout the place room by room, and use the spider messenger to send back the report on what each room contains. Using this tactic, Cleo is able to scout the entire first floor and as she goes, she discovers various enemies, chests, and other interesting items, noting them on the map. This has the side effect of totally removing any surprise from the encounters, so I really need to think up a countermeasure for this plan at some point. Anyway, the party regroups and decides to sneak into an unoccupied office to search it for clues. Unfortunately they fail a Stealth check and make enough noise to attract the attention of the man in the next office over. This man is Leo Splinter, one of the Splinter brothers who run the Slaughterhouse. He is immediately in combat mode, and calls for help. He manages to keep the party contained in that small office by standing in the doorway, forcing the party to deal with him one at a time. In response, Pilgrim forces him back a square to clear the way for everyone else. Meanwhile, Mike Splinter comes running with backup in the form of a small pack of attack dogs. My players take a short moment to inform me that I need to think of better character names that aren't adapted from pop-culture references. They might have a point. The battle goes fairly well, with the dogs going down fairly quickly and Leo forced into a flanked position and dispatched without much of a struggle. Mike sees things going awry and attempts to flee, sprinting down the hall towards the main processing room. Despite provoking several opportunity attacks, Mike manages to reach the room with just 2 hit points remaining. Inside the room stands a Flesh Golem, a huge creature composed of the body parts of multiple corpses, like a giant Frankenstein creation. He borrowed those green pants from another hulking monster. The Flesh Golem is, hands down, my favorite monster used thus far. He can make two basic attacks per turn, is a freakin' tank for soaking up damage, comes with an Action Point (rare for enemies), and has a special renewable ability that allows him to run straight through enemy squares and do damage as he goes. The catch is that he's a Level 12 monster, which would be way too much to spend up against my Level 2 party under normal circumstances. I had to de-level it before making it a suitable match, and as a first time DM, I had no clue how to do that. It's not as simple as taking every number and dividing by two, there's a percentage involved. A quick Google search gave me a handy guide, and a few minutes of calculations gave me a decent adjustment. I also turned it from a Large creature (2x2) into a standard Medium because A) it's not as strong as it should be and B) it wouldn't fit through the doors and halls otherwise. Anyway, back to the game. Mike lasts just long enough to issue a command to the Flesh Golem: Attack. Most of the party engages, taking Mike out almost immediately before focusing on the Golem. Pilgrim gets the brilliant idea to run back to Leo Splinter's body, cut off his face, and attempt to disguise himself as the dead man in an effort to fool the Golem into thinking he is it's master. Take a second to re-read that, please. I can't tell if Pilgrim's player isn't thinking creatively (disguises again?) or is thinking too creatively (did you watch Face Off recently?). So while the fight is going on around the corner, Pilgrim is applying his thieves tools to Leo's face in an effort to surgically remove it. This is an interesting skill challenge. There's nothing in the sourcebooks to cover this particular situation, so I have to improvise. I give Pilgrim's player the choice of using either his Heal or Thievery skills into this, since this could be looked at as a test of either medical knowledge or dextrous skill. He goes with Thievery, given his lack of medical training. While I am encouraged by the DM guide to encourage unorthodox thinking, this is a very difficult challenge, so I set a DC20 with a complexity 3 (8 successes before 4 failures). He fails completely, and the result is a flimsy torn flesh mask that looks like the one Hannibal Lecter had on during his escape from Silence of the Lambs. Bless his big heart and small brain, he tries it on anyway and attempts to order the Golem to stop. Not only does it fail, he gets knocked flat during one of the Golem's Rampage attacks. At this point, the Pilgrim's combat failures could be a drinking game. Take a shot every time he goes down, and stop when you go down. The rest of the party performs quite well, busting out their Daily powers to do massive damage. As it becomes bloodied (and takes a free shot as a result, I love this thing! ), it elects to focus it's assault on the last enemy that hit it, which happens to be Freya who is standing down the hall. A recharged Rampage attack allows it to run right through every party member in the way, and it begins chasing Freya through the halls. I'm so happy because I get to re-enact that classic horror trope of the monster chasing the frail screaming woman as she runs for her life. It only lasts one round sadly, since the party is able to cut the Golem down before it actually catches Freya, but I was still pleased with myself. That was as good a place as any to end the session. On the one hand, the party has taken down the heavy hitter of the dungeon and made some major progress. On the other, they've all expended their Daily powers and still have roughly 60% of the place to clear out. While they have picked up an extra Action Point from reaching a milestone (two encounters without an extended rest ((technically it was just one encounter but it was big enough for two))), the next session is going to be a bit of a challenge. Let's find out!